Reincarnation On Stage is the second live album by German progressive rock band Eloy. It was recorded on their reunion tour in Germany and Switzerland in 2012/13. Their earlier live album was Eloy Live. This is a very good live album packed with melodic symphonic progressive rock. If you want to branch out in your prog rock collection of albums, then this is a great place to start. I realise that it’s well past their vintage era but the band do an excellent job of interpreting their studio songs for a live concert and the sound quality is exceptionally clear. It’s also very highly regarded at progarchives.com with an astonishing rating of 4.43 with a mark of 4 representing excellent and 5 identifying essential albums. To put that into perspective, Seconds Out has a rating of 4.29 and Foxtrot and Selling England By The Pound are around the 4.6 level. 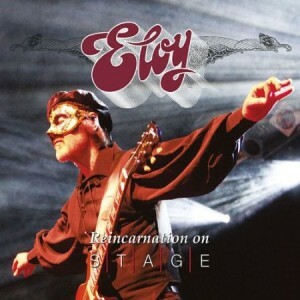 Is it the best live album by Eloy? Which do you recommend? Please vote in the poll to find the best prog rock live albums. You may also be interested in the poll to find the best art rock live albums. This entry was posted in 2010s Live Albums, Progressive Rock Live Albums and tagged 2010s Prog, 2013 Live Albums, Eloy Live Albums by Paul Simister. Bookmark the permalink.